For decades, drivers shopping for new Toyota cars in Salem, NH have looked to Toyota cars, SUVs, and trucks to push the edge of what you can expect from a new car. 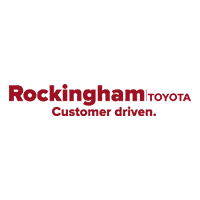 From long-lasting models like the Toyota Camry to the capable Toyota Highlander, and the spacious Toyota RAV-4, Rockingham Toyota has a wide inventory of new cars in Salem, NH from you to choose from. When you’re ready to see a model in person, feel free to contact our Toyota dealership near the Lawrence, MA border. We’ll be happy to walk you through our fast and easy financing process and help you schedule a test drive in a new Toyota down Route 28. SAFETY & CONVENIENCE Toyota Safety Sense-P: Pre-Collision Sys w/Pedestrian Detection, Dynamic Radar Cruise Control, Lane Departure Alert w/ Steering Assist, Automatic High Beams Star Safety System Includes: VSC, TRAC, Anti-lock Brake System, EBD, Brake Assist & Smart Stop Technology 8 Airbags: Dr & Fr Pass Adv Airbag Sys, Dr & Fr Pass Seat-Mounted Side Airbags, Dr Knee Airbag, Pass Seat Cushion Airbag Front & Rear Side Curtain Airbags LATCH (Lwr Anchors&Tethers for CHildren) for Outboard Rear Seating Positions Only Whiplash-Injury Lessening Front Seats EXTERIOR Bi-LED Headlights LED Daytime Running Lights In Headlight Color-Keyed Heated Power Outside Mirrors INTERIOR Premium Fabric-Trimmed 6-Way Adj Dr Seat 4-Way Adj Fr Pass Seat w/Seatback Pocket Entune Audio w/6.1 Touch-screen incl Entune Multimedia Bundle (AUX/USB/BT/ Adv Voice Recognition), Siri Eyes Free 3.5-in Monochrome TFT Multi-Info Display Integrated Backup Camera w/Projected Pth Steering Wheel w/ Audio & Bluetooth Hands-Free Phone Voice Command Controls Auto Climate Control w/ Pollen Filter and Push Button Controls Remote Keyless Entry System Power Door Locks and Windows, Corolla LE, 4D Sedan, CVT, Gray Metallic, Black Cloth. 28/36 City/Highway MPG** Here at Rockingham Toyota we believe that our customers appreciate pricing that only includes standard rebates (those that everyone qualifies for). Please understand that there may be additional rebates which you could be entitled to and receive! Contact us to confirm availability and pricing! **Here at Rockingham Toyota We take our Internet Business Very Seriously!Shopping at Rockingham Toyota is car buying the way it should be; Fun, Informative, and Fair! Here are our promises:* Transparent Pricing and Sales Process- No Gimmicks!! *Pressure Free , Efficient, Friendly, and Helpful Sales Staff! *In House Team of Loan and Lease Specialists! They are Good with Numbers, and Even Better with People! Credit Challenged? Give us a try! * Massive Inventory For One Stop Shopping! * Certified Factory Service Technicians!Rockingham Toyota, Holds the Dealer Rater 2018 Toyota Dealer of the Year Award! In Addition Check Out Our Google Reviews at 4.8 stars - Highest in the Area North of Boston. SAFETY & CONVENIENCE Toyota Safety Sense-P: Pre-Collision Sys w/Pedestrian Detection, Dynamic Radar Cruise Control, Lane Departure Alert w/ Steering Assist, Automatic High Beams Star Safety System Includes: VSC, TRAC, Anti-lock Brake System, EBD, Brake Assist & Smart Stop Technology 8 Airbags: Dr & Fr Pass Adv Airbag Sys, Dr & Fr Pass Seat-Mounted Side Airbags, Dr Knee Airbag, Pass Seat Cushion Airbag Front & Rear Side Curtain Airbags LATCH (Lwr Anchors&Tethers for CHildren) for Outboard Rear Seating Positions Only Whiplash-Injury Lessening Front Seats EXTERIOR Bi-LED Headlights LED Daytime Running Lights In Headlight Color-Keyed Heated Power Outside Mirrors INTERIOR Premium Fabric-Trimmed 6-Way Adj Dr Seat 4-Way Adj Fr Pass Seat w/Seatback Pocket Entune Audio w/6.1 Touch-screen incl Entune Multimedia Bundle (AUX/USB/BT/ Adv Voice Recognition), Siri Eyes Free 3.5-in Monochrome TFT Multi-Info Display Integrated Backup Camera w/Projected Pth Steering Wheel w/ Audio & Bluetooth Hands-Free Phone Voice Command Controls Auto Climate Control w/ Pollen Filter and Push Button Controls Remote Keyless Entry System Power Door Locks and Windows, Corolla LE, 4D Sedan, CVT, Barcelona Red Metallic, Ash Cloth. 28/36 City/Highway MPG** Here at Rockingham Toyota we believe that our customers appreciate pricing that only includes standard rebates (those that everyone qualifies for). Please understand that there may be additional rebates which you could be entitled to and receive! Contact us to confirm availability and pricing! **Here at Rockingham Toyota We take our Internet Business Very Seriously!Shopping at Rockingham Toyota is car buying the way it should be; Fun, Informative, and Fair! Here are our promises:* Transparent Pricing and Sales Process- No Gimmicks!! *Pressure Free , Efficient, Friendly, and Helpful Sales Staff! *In House Team of Loan and Lease Specialists! They are Good with Numbers, and Even Better with People! Credit Challenged? Give us a try! * Massive Inventory For One Stop Shopping! * Certified Factory Service Technicians!Rockingham Toyota, Holds the Dealer Rater 2018 Toyota Dealer of the Year Award! In Addition Check Out Our Google Reviews at 4.8 stars - Highest in the Area North of Boston. Recent Arrival! Corolla LE, 4D Sedan, 1.8L I4 DOHC Dual VVT-i, CVT, FWD, Super White, Cloth. 28/36 City/Highway MPG** Here at Rockingham Toyota we believe that our customers appreciate pricing that only includes standard rebates (those that everyone qualifies for). Please understand that there may be additional rebates which you could be entitled to and receive! Contact us to confirm availability and pricing! **Here at Rockingham Toyota We take our Internet Business Very Seriously!Shopping at Rockingham Toyota is car buying the way it should be; Fun, Informative, and Fair! Here are our promises:* Transparent Pricing and Sales Process- No Gimmicks!! *Pressure Free , Efficient, Friendly, and Helpful Sales Staff! *In House Team of Loan and Lease Specialists! They are Good with Numbers, and Even Better with People! Credit Challenged? Give us a try! * Massive Inventory For One Stop Shopping! * Certified Factory Service Technicians!Rockingham Toyota, Holds the Dealer Rater 2018 Toyota Dealer of the Year Award! In Addition Check Out Our Google Reviews at 4.8 stars - Highest in the Area North of Boston. Recent Arrival! Apple Car Play, Back up camera, 15 inch alloy wheels, Corolla Hybrid LE, 4D Sedan, 1.8L I4 DOHC 16V, CVT, FWD, Blizzard Pearl, Black Cloth. 53/52 City/Highway MPG** Here at Rockingham Toyota we believe that our customers appreciate pricing that only includes standard rebates (those that everyone qualifies for). Please understand that there may be additional rebates which you could be entitled to and receive! Contact us to confirm availability and pricing! **Here at Rockingham Toyota We take our Internet Business Very Seriously!Shopping at Rockingham Toyota is car buying the way it should be; Fun, Informative, and Fair! Here are our promises:* Transparent Pricing and Sales Process- No Gimmicks!! *Pressure Free , Efficient, Friendly, and Helpful Sales Staff! *In House Team of Loan and Lease Specialists! They are Good with Numbers, and Even Better with People! Credit Challenged? Give us a try! * Massive Inventory For One Stop Shopping! * Certified Factory Service Technicians!Rockingham Toyota, Holds the Dealer Rater 2018 Toyota Dealer of the Year Award! In Addition Check Out Our Google Reviews at 4.8 stars - Highest in the Area North of Boston. 17 Alloy Wheels with P215/55R17 Tires Bi-LED Combination Headlights w/Auto On/Off Feature LED DRLs w/On/Off Feature Dark Gray Front Grille Color-Keyed Power Outside Mirrors INTERIOR Entune 3.0 Audio w/App Suite 7 Touch Screen, 6 Speakers, HandsFree Bluetooth Phone/Music, USB Media Port, Siri Eyes Free, Apple CarPlay Compatible 8-Way Power Driver Seat w/Lumbar Support 60/40 split fold-down rear seat Steering Wheel w/Audio and Bluetooth Hands-Free Phone & Voice Command Cntrls Backup Camera w/Projected Path 4.2 TFT Multi-Information Display Remote Keyless Entry System, Toyota Safety Sense P: Pre-Collision Sys w/Pedestrian Detection, Dynamic Radar Cruise Control, Lane Departure Alert w/ Steering Assist, Automatic High Beams Star Safety System: VSC, TRAC, ABS, Elect Brake-Force Distribution, Brake Assist(BA) & Smart Stop Technology (SST) LATCH-Lower Anchor & Tether for CHildren Whiplash-Injury-Lessening Front Seats Ten Airbags Anti-theft system with alarm,, Camry LE, 4D Sedan, Super White, Macadamia Cloth. 28/39 City/Highway MPG** Here at Rockingham Toyota we believe that our customers appreciate pricing that only includes standard rebates (those that everyone qualifies for). Please understand that there may be additional rebates which you could be entitled to and receive! Contact us to confirm availability and pricing! **Here at Rockingham Toyota We take our Internet Business Very Seriously!Shopping at Rockingham Toyota is car buying the way it should be; Fun, Informative, and Fair! Here are our promises:* Transparent Pricing and Sales Process- No Gimmicks!! *Pressure Free , Efficient, Friendly, and Helpful Sales Staff! *In House Team of Loan and Lease Specialists! They are Good with Numbers, and Even Better with People! Credit Challenged? Give us a try! * Massive Inventory For One Stop Shopping! * Certified Factory Service Technicians!Rockingham Toyota, Holds the Dealer Rater 2018 Toyota Dealer of the Year Award! In Addition Check Out Our Google Reviews at 4.8 stars - Highest in the Area North of Boston. 17 Alloy Wheels with P215/55R17 Tires Bi-LED Combination Headlights w/Auto On/Off Feature LED DRLs w/On/Off Feature Dark Gray Front Grille Color-Keyed Power Outside Mirrors INTERIOR Entune 3.0 Audio w/App Suite 7 Touch Screen, 6 Speakers, HandsFree Bluetooth Phone/Music, USB Media Port, Siri Eyes Free, Apple CarPlay Compatible 8-Way Power Driver Seat w/Lumbar Support 60/40 split fold-down rear seat Steering Wheel w/Audio and Bluetooth Hands-Free Phone & Voice Command Cntrls Backup Camera w/Projected Path 4.2 TFT Multi-Information Display Remote Keyless Entry System, Toyota Safety Sense P: Pre-Collision Sys w/Pedestrian Detection, Dynamic Radar Cruise Control, Lane Departure Alert w/ Steering Assist, Automatic High Beams Star Safety System: VSC, TRAC, ABS, Elect Brake-Force Distribution, Brake Assist(BA) & Smart Stop Technology (SST) LATCH-Lower Anchor & Tether for CHildren Whiplash-Injury-Lessening Front Seats Ten Airbags Anti-theft system with alarm,, Camry LE, 4D Sedan, Celestial Silver Metallic, Black Cloth. 28/39 City/Highway MPG** Here at Rockingham Toyota we believe that our customers appreciate pricing that only includes standard rebates (those that everyone qualifies for). Please understand that there may be additional rebates which you could be entitled to and receive! Contact us to confirm availability and pricing! **Here at Rockingham Toyota We take our Internet Business Very Seriously!Shopping at Rockingham Toyota is car buying the way it should be; Fun, Informative, and Fair! Here are our promises:* Transparent Pricing and Sales Process- No Gimmicks!! *Pressure Free , Efficient, Friendly, and Helpful Sales Staff! *In House Team of Loan and Lease Specialists! They are Good with Numbers, and Even Better with People! Credit Challenged? Give us a try! * Massive Inventory For One Stop Shopping! * Certified Factory Service Technicians!Rockingham Toyota, Holds the Dealer Rater 2018 Toyota Dealer of the Year Award! In Addition Check Out Our Google Reviews at 4.8 stars - Highest in the Area North of Boston. 17 Alloy Wheels with P215/55R17 Tires Bi-LED Combination Headlights w/Auto On/Off Feature LED DRLs w/On/Off Feature Dark Gray Front Grille Color-Keyed Power Outside Mirrors INTERIOR Entune 3.0 Audio w/App Suite 7 Touch Screen, 6 Speakers, HandsFree Bluetooth Phone/Music, USB Media Port, Siri Eyes Free, Apple CarPlay Compatible 8-Way Power Driver Seat w/Lumbar Support 60/40 split fold-down rear seat Steering Wheel w/Audio and Bluetooth Hands-Free Phone & Voice Command Cntrls Backup Camera w/Projected Path 4.2 TFT Multi-Information Display Remote Keyless Entry System, Toyota Safety Sense P: Pre-Collision Sys w/Pedestrian Detection, Dynamic Radar Cruise Control, Lane Departure Alert w/ Steering Assist, Automatic High Beams Star Safety System: VSC, TRAC, ABS, Elect Brake-Force Distribution, Brake Assist(BA) & Smart Stop Technology (SST) LATCH-Lower Anchor & Tether for CHildren Whiplash-Injury-Lessening Front Seats Ten Airbags Anti-theft system with alarm,, Camry LE, 4D Sedan, Aqua, Black Cloth, Alloy wheels, Remote keyless entry, Steering wheel mounted audio controls, Variably intermittent wipers. 28/39 City/Highway MPG** Here at Rockingham Toyota we believe that our customers appreciate pricing that only includes standard rebates (those that everyone qualifies for). Please understand that there may be additional rebates which you could be entitled to and receive! Contact us to confirm availability and pricing! **Here at Rockingham Toyota We take our Internet Business Very Seriously!Shopping at Rockingham Toyota is car buying the way it should be; Fun, Informative, and Fair! Here are our promises:* Transparent Pricing and Sales Process- No Gimmicks!! *Pressure Free , Efficient, Friendly, and Helpful Sales Staff! *In House Team of Loan and Lease Specialists! They are Good with Numbers, and Even Better with People! Credit Challenged? Give us a try! * Massive Inventory For One Stop Shopping! * Certified Factory Service Technicians!Rockingham Toyota, Holds the Dealer Rater 2018 Toyota Dealer of the Year Award! In Addition Check Out Our Google Reviews at 4.8 stars - Highest in the Area North of Boston. 17 Alloy Wheels with P215/55R17 Tires Bi-LED Combination Headlights w/Auto On/Off Feature LED DRLs w/On/Off Feature Dark Gray Front Grille Color-Keyed Power Outside Mirrors INTERIOR Entune 3.0 Audio w/App Suite 7 Touch Screen, 6 Speakers, HandsFree Bluetooth Phone/Music, USB Media Port, Siri Eyes Free, Apple CarPlay Compatible 8-Way Power Driver Seat w/Lumbar Support 60/40 split fold-down rear seat Steering Wheel w/Audio and Bluetooth Hands-Free Phone & Voice Command Cntrls Backup Camera w/Projected Path 4.2 TFT Multi-Information Display Remote Keyless Entry System, Toyota Safety Sense P: Pre-Collision Sys w/Pedestrian Detection, Dynamic Radar Cruise Control, Lane Departure Alert w/ Steering Assist, Automatic High Beams Star Safety System: VSC, TRAC, ABS, Elect Brake-Force Distribution, Brake Assist(BA) & Smart Stop Technology (SST) LATCH-Lower Anchor & Tether for CHildren Whiplash-Injury-Lessening Front Seats Ten Airbags Anti-theft system with alarm,, Camry LE, 4D Sedan, Predawn Gray Mica, Ash Cloth. 28/39 City/Highway MPG** Here at Rockingham Toyota we believe that our customers appreciate pricing that only includes standard rebates (those that everyone qualifies for). Please understand that there may be additional rebates which you could be entitled to and receive! Contact us to confirm availability and pricing! **Here at Rockingham Toyota We take our Internet Business Very Seriously!Shopping at Rockingham Toyota is car buying the way it should be; Fun, Informative, and Fair! Here are our promises:* Transparent Pricing and Sales Process- No Gimmicks!! *Pressure Free , Efficient, Friendly, and Helpful Sales Staff! *In House Team of Loan and Lease Specialists! They are Good with Numbers, and Even Better with People! Credit Challenged? Give us a try! * Massive Inventory For One Stop Shopping! * Certified Factory Service Technicians!Rockingham Toyota, Holds the Dealer Rater 2018 Toyota Dealer of the Year Award! In Addition Check Out Our Google Reviews at 4.8 stars - Highest in the Area North of Boston. Wheel Locks, 17 Alloy Wheels with P215/55R17 Tires Bi-LED Combination Headlights w/Auto On/Off Feature LED DRLs w/On/Off Feature Dark Gray Front Grille Color-Keyed Power Outside Mirrors, Entune 3.0 Audio w/App Suite 7 Touch Screen, 6 Speakers, HandsFree Bluetooth Phone/Music, USB Media Port, Siri Eyes Free, Apple CarPlay Compatible 8-Way Power Driver Seat w/Lumbar Support 60/40 split fold-down rear seat Steering Wheel w/Audio and Bluetooth Hands-Free Phone & Voice Command Cntrls Backup Camera w/Projected Path 4.2 TFT Multi-Information Display Remote Keyless Entry System, Toyota Safety Sense P: Pre-Collision Sys w/Pedestrian Detection, Dynamic Radar Cruise Control, Lane Departure Alert w/ Steering Assist, Automatic High Beams Star Safety System: VSC, TRAC, ABS, Elect Brake-Force Distribution, Brake Assist(BA) & Smart Stop Technology (SST) LATCH-Lower Anchor & Tether for CHildren Whiplash-Injury-Lessening Front Seats Ten Airbags Anti-theft system with alarm, 2.5L Dynamic Force 4-Cyl DOHC 16V D-4S Dual Injection w/Dual VVT-i Engine 203 hp @ 6600 rpm / 184 lb-ft @ 5000 rpm Direct Shift 8-Speed ECTi Transmission w/Sequential Shift Mode Pwr-Assist Front/Solid Rear Disc Brakes, Camry LE, 4D Sedan, Brownstone, Black Cloth. 28/39 City/Highway MPG** Here at Rockingham Toyota we believe that our customers appreciate pricing that only includes standard rebates (those that everyone qualifies for). Please understand that there may be additional rebates which you could be entitled to and receive! Contact us to confirm availability and pricing! **Here at Rockingham Toyota We take our Internet Business Very Seriously!Shopping at Rockingham Toyota is car buying the way it should be; Fun, Informative, and Fair! Here are our promises:* Transparent Pricing and Sales Process- No Gimmicks!! *Pressure Free , Efficient, Friendly, and Helpful Sales Staff! *In House Team of Loan and Lease Specialists! They are Good with Numbers, and Even Better with People! Credit Challenged? Give us a try! * Massive Inventory For One Stop Shopping! * Certified Factory Service Technicians!Rockingham Toyota, Holds the Dealer Rater 2018 Toyota Dealer of the Year Award! In Addition Check Out Our Google Reviews at 4.8 stars - Highest in the Area North of Boston. Why Choose New Toyota Cars Over The Competition? See what auto industry experts have to say about new Toyota vehicles like the new Camry, new Corolla, and more. Learn more about interior features on the new 4Runner or Toyota Corolla interior, and when you’re ready to see our inventory in person, be sure to stop by Rockingham Toyota in Salem today.